Young girl receives vaccine. Content Provider: CDC/Amanda Mills. The term “herd immunity” does not sound like it should apply to humans. We usually talk about herds when we talk about other animals such as cattle or sheep. But, in this case, herd immunity (also called community immunity) is a good term for the immunity, or protection from disease, for a group of people. It is important to understand how herd immunity works to protect members of a population who may not be able to receive immunizations as it prevents a disease from taking hold in a community. Any immunity involves protection against disease. A person can achieve immunity through vaccination, from having had the disease, or by receiving antibodies that fight the disease. Herd immunity is a different type of immunity since a person is protected from disease by other people being immunized. A virus needs a certain number of susceptible people in the community in order for it to spread and stay active. When enough people in the community are vaccinated and protected against the disease, the disease cannot easily be passed on and will die out fairly quickly. People who cannot get immunized, are too young to be immunized yet, or are too sick to be immunized are still protected because other people are protected and the pathogen cannot take hold in the community. The unvaccinated are protected by the herd. 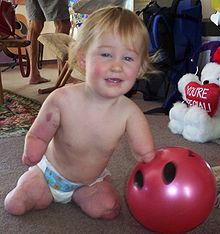 Small child who had to have her arms and legs partially amputated due to meningococcal disease. Mass vaccinations and herd immunity can prevent children who are too young to be vaccinated. There are many examples. Vaccinating adults against pertussis reduces pertussis in infants too young to be vaccinated. Children who are immunized against pneumococcus reduce the incidence of pneumococcal disease in younger, unvaccinated children and also in adults, who do not always get the vaccine. The elderly have always been a priority group in receiving the seasonal flu shot as they are more susceptible to adverse complications of influenza. Research has shown that also prioritizing school-age children for immunization has created herd immunity protection for the elderly. Herd immunity is an effective way to protect some community members from disease, but it does not protect against all disease. Firstly, it can only protect against vaccine-preventable disease. If there is no vaccine for a disease, no herd immunity can be built. Secondly, it protects against diseases that are infectious and contagious and therefore, does not protect against all vaccine-preventable diseases. For example, tetanus is infectious, is vaccine-preventable, but is not contagious. Tetanus is caused by a bacteria, Clostridium tetani, present in the environment. Everyone around you could be vaccinated for tetanus, but it will not protect you from getting the disease if you are exposed to it in the environment. Thirdly, it relies on a certain number of people in a population being immunized. The percentage of people who need to be immunized for herd immunity to be effective is different for each disease. As an example, consider herd immunity for measles in England. Measles incidences were low in England and Wales until public complacency due to lack of outbreaks and unproven claims concerning the safety of the vaccine caused people to stop or delay vaccination for their children. Herd immunity dropped and measles outbreaks began to appear. When cases in a prolonged outbreak reached highest levels in 18 years, health experts in England encouraged people to vaccinate their children. Vaccination rates began to go back up, but herd immunity needs time to build; certain percentages need to be maintained. For a highly infectious disease like measles, epidemiologists estimate that 19 out of every 20 people need to be vaccinated against measles in order for measles herd immunity to be effective. It is also important to remember that herd immunity does not provide a high level of individual immunity, but relies on others’ immunity to provide protection. It is not a good substitute for individual immunization, but it is still protection for those people who cannot be immunized. 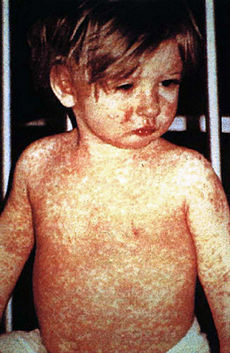 Child with measles rash. Content Provider: CDC/NIP/Barbara Rice. Look at the graphic below. In the first graphic, the population is not immunized and when a pathogen enters the population, many people become sick and contagious. 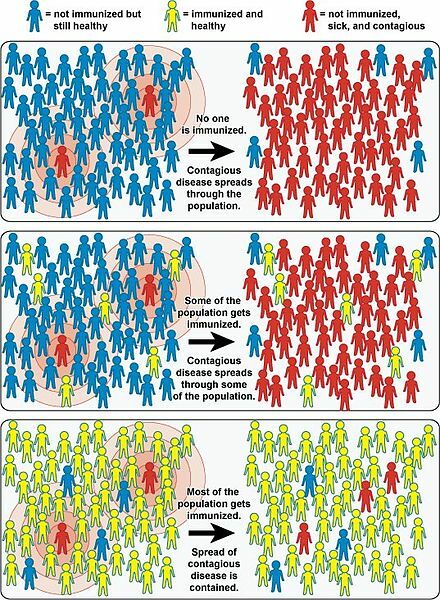 In the second graphic, a few people are immunized and when the pathogen enters the population, only those people who are immunized remain healthy along with a few others who may have some natural immunity to the disease. In the third graphic, most people are immunized and most remain healthy. The few who become sick and contagious cannot pass along the disease to other members of the population who are immunized and protected.